A portrait of Theodosius Botkin taken in Topeka, Kansas when he served in the legislature. He came to Kansas in 1865 and settled in Linn County. He taught school and was later principal at Pleasanton for four years. In 1875, he located to Mound City and was admitted to the bar. Botkin served as probate judge in Linn County and police judge of Mound City. 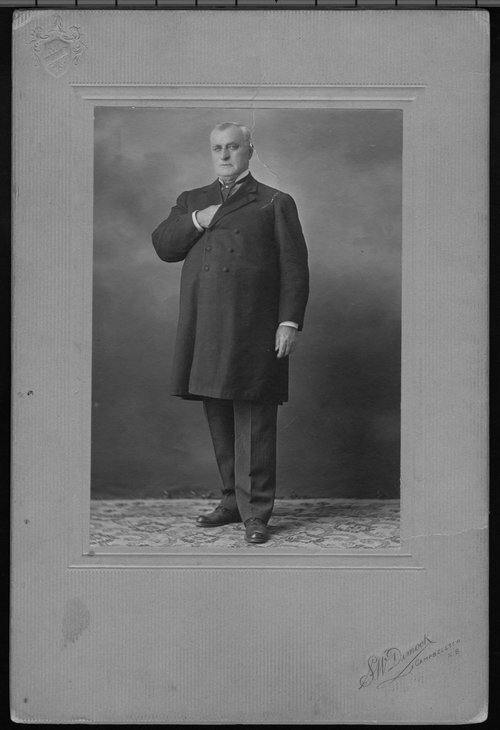 In March 1889, Governor Humphrey appointed him judge of the Thirty-Second District in Stevens County. It was in his court that Samuel N. Wood was assassinated in June, 1891. Impeachment proceedings were brought against Botkin, but he was acquitted on all charges. Botkin resigned the judgeship on October 11, 1892 and he moved to Hutchinson, Kansas. In 1896 he was elected to the Kansas House of Representatives from Reno County. A year later he was named commander of the Grand Army, Department of Kansas. In 1901 he settled in Salt Lake, Utah where he practiced law. Botkin died May 27, 1918 in Salt Lake.